610 Cardio Platform and Plyometric Steps This contains a set up 3 steps which increase in height from 6 inches – 10 inches – 14 inches. Each platform is powder coated in bright primary color. These units are ideal for both strength and cardio classes for children. 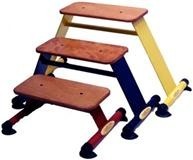 Order your Cardio Kids 610 Platform and Plyometric Steps (set 3) from FitnessZone.com today!